My solution involves using a small Canon point-and-shoot camera loaded with the CHDK software and an additional LUA script to drive the camera operations. 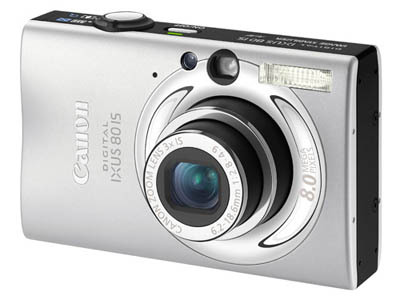 The choice camera for these sort of missions are often the Canon Ixus Series (sold in the USA as the SD series). So far, I have used the Ixus 80 IS (marketed in the US as SD1100) camera, that sports an 8 Mp resolution (more than we need, actually) weights about 175 grams including the battery and is currently sold at about $130-$140. the lack of an iris. After the lens (with its focusing and zooming mechanisms), the iris is often only other moving part in a camera. Moving parts always increase costs, weight and make life harder to engineers, and that's why Canon removed the Iris from the SD1100. To be able to operate in a wide range of luminosity even without an iris, the Sd1100 has a ND filter (basically, a grey filter that takes away most of thelight) that automatically switches in when there's a lot of light. The camera "lies" to you and says it's suddenly changing aperture from 2.8 to 7.1, but in effects it's just switching the filter in, with a decrease in luminosity that is equivalent to the decrease in luminosity you would have changing the aperture from 2.8 to 7.1. Without an Iris, it's impossible to implement a real shutter priority mode. This is a shame, because a shutter prioriry mode would allow us to solve the blur problem by telling the camera: Shoot at 1/2000", and adjust the aperture accordingly. Luckily, CHDK (and some extra programming) offers us the way to overcome this problem by simulating a sort-of Tv Mode, where we decide the shutter time we want and - instead of adjusting aperture to find the correct exposure - we adjust the ISO setting to get the same result. With some caveats, this has given surprisignly good results.